"Points of You - The Coaching Game"
And I’m gonna win it, yeah yeah, a-ha, from a world of madness to something so divine. In the late 80’s. Toots played at Fat Tuesday’s in New York. I went to see him with several friends. He had a trio. After the set was over, as I walked to the men’s room Toots was walking in my direction. As he was about to pass I said, “Oh Toots, I wish you would have played the theme to ‘Jean de Florette’!”, a beautiful theme he had recorded for both this movie and its sequel, “Manon of the Spring.” Toots stopped and said, “Are you staying for another set?” I told him I hadn’t planned to, and he responded, “If you stay another set, I will play it for you. But if I forget, please remind me.” My friends left, and I stayed, and sat directly in front of the stage, several feet to the left of Toots. As the set was winding down, I called out, “Jean de Florette!” He said, “Oh yes,” and told the audience, “I sometimes record movie themes, and I recorded this theme for a movie a few years ago.” Turning to his musicians, he said, “I didn’t bring charts for this, so you guys just hang out.” He then turned his chair to face me, and locked eyes with me, and then played this beautiful theme, never once looking away. I was in tears by the end of it. Even typing this, I get choked up by it. What an extraordinary gift from a most generous and talented man. Sometimes, I get obsessive about things. I admit it. Some idea gets in my head, and I can’t just let it go. This kind of thing can both serve me and disserve me. After all, my ability to play guitar today is the resuot of my obsession with teaching myself to play the guitar when I was 13. In this particular case, I’m not sure what to make of it. Last year I discovered Beanitos. These are a snack chip made entirely from rice and beans, no corn at all, and which have a mouth feel and taste that gives me the same level of satisfaction as a good potato chip. Unlike other snack chips, these are high in protein and, if not as healthy a choice as an actual dish of rice and beans, they at least have gotten me, to a great extent, away from my potato chip addiction. They are also pointedly free of GMO products, which is a big thing with me. 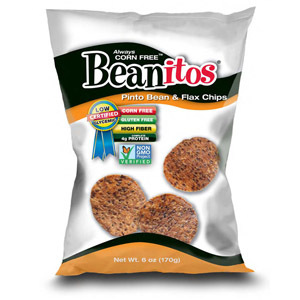 I learned from Beanitos’ Facebook page that they reluctantly had to discontinue the product because the process of crushing the flax seeds sometimes caused problems with the product, to the extent that some of it smelled rancid, and their customers “overwhelmingly” did not care for this. I had never encountered this issue, and the thought occurred to me that they could not have possibly sold out of every bag. There must be some unsold product somewhere. I turned, of course, to Google, and searched for my chips. One after another, I found the chips seemingly for sale, but accompanied by the words “currently unavailable.” Then I searched for companies that sold things like unsold stock. Ultimately, I found one company that sold mainly wholesale, and apparently had the chips in stock, either single bags or boxes of nine bags. I called them to make sure, and learned they had exactly ten bags left. I ordered all ten for $37.19, including shipping.. They arrived within a few days. Usually, when I get something delivered that I bought online, I hear in my head the “Wells Fargo Wagon” song from “The Music Man.” When the box came today, I did not hear this song in my head. Instead, all I could hear was my dad’s voice, saying, “What are you, meshugenah? Are you out of your mind?” Maybe, since I just opened a bag, and… feh. They smelled stale, and were inedible. I called the distributor, and they’re sending Fed Ex to pick up the rest of them next week. So I’ll just be out the $3.75 for the bag I opened. Next time I get my mind wrapped around something and I can’t let go, I will say to myself, Beanitos! My 75,000th listen contest is now live! Qualified entries only! To win, follow me on Twitter (www.twitter.com/coachandrew), then send an email (coach @ andrewporetz .com) with the subject line “Put me in, Coach!” In the body, tell me that you believe you’re the 75,000th listener, your Twitter name, and tell me the name of the guest and something you learned from any show of mine that you listened to. The second and third persons to write in will each win a one-month coaching package. But wait, there’s more! I will also choose the person who writes the most insightful response to what they learned from the show for a one-month coaching package! All others will receive an initial assessment and free one-hour coaching session and a 10% discount on all coaching services just for participating! 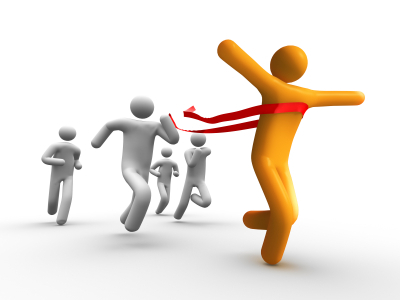 The three winners also qualify for a 20% discount on all future coaching services. Coaches’ Corner about to hit 75,000 total downloads! To find my show on iTunes, you might use this handy short URL: www.bit.ly/coachescorner, and you’ll be taken right to the page. To celebrate my imminent 75,000th download, I also have a contest going. The first person to write to me (at coach @ andrewporetz.com) and say “I’m your 75,000th listener” (along with the guidelines below) will win a full three-month telephone coaching package and assessment valued at up to $1,497! Qualified entries only! To win, follow me on Twitter (www.twitter.com/coachandrew) and check for my announcement that I’ve surpassed 75,000 listeners, then send an e-mail with the subject line “Put me in, Coach!” In the body, tell me that you believe you’re the 75,000th listener, and tell me the name of my guest and a short description of the show you listened to. Most importantly, tell me something you learned from listening to the show. The second and third persons to write in will each win a one-month coaching package. But wait, there’s more! I will also choose a random person who wrote the most insightful response to what they learned from the show for a one-month coaching package! The clock starts the moment my show reaches 75,000 listens (as of April 10th I’m at 73,653, so it can happen in the next day or so) and ends when I have my first three winners, though any qualified entry before Memorial Day will qualify for the free coaching session and discount. Good luck! I love kickstarter.com — it’s an amazing resource that has helped many people fund projects through crowdsourcing in a way that was impossible just a few years ago. I’ve happily contributed to and helped promote several that have caught my eye. Last week I met a fascinating, engaging and highly spiritual young woman named Sarah Barab. She told me about her six-year journey to create a movie about the power of meditation, good chunks of footage for which have already been shot, and she told me about her kickstarter campaign for this movie, called Naked Mind. When I read the website and saw the trailer, I felt compelled to help. With only little more than a week to go, I wanted to do more than give a small donation. Of course, I invited her onto my Coaches’ Corner radio show on BlogTalkRadio. I also offered some of my services to be given away as kickstarter perks. Tune in now to Coaches’ Corner with guest Sarah Barab and check out her Kickstarter campaign at Naked Mind. I’ve written before about Groundhog Day, but this is a different story. The truth is, the movie “Groundhog Day” is my muse. Recently my friend Charlotte exclaimed on Facebook, “You must live 720 days a year!” This was after I had spent the early afternoon sledding in Central Park with one group of friends, met Charlotte for an exhibit in Tribeca about the late Andy Kaufman, and had taken the train back uptown with her. A mere hour after she got off the train for her stop, she saw my post: “On my way to a jam session in Times Square!” Charlotte commented, “But you JUST GOT HOME!! !” I hadn’t planned to go to a jam session until a “last minute” invitation from singer-songwriter Emily Forst came my way. My intinct told me to say “yes,” and then figure out the “how” later. It all comes from “Groundhog Day.” If you’ve seen the movie, you know that Bill Murray’s character’s breakthrough begins when Andie Macdowell suggests he uses his time to improve himself, and he takes this on with gusto, using what had been a terrible curse, but now the incredible gift (with a new perspective) of unlimited time, and learns so many things that would have otherwise taken literally lifetimes to learn. He has the time, and takes the time, to learn about everyone he meets, no matter how seemingly insignificant they might have seemed before. He becomes an expert pianist, ballroom dancer, ice sculptor, linguist, even a doctor. Of course, this is just a movie, and even if it weren’t, I’m not the one trapped in a time vortex. But it does make me realize how short life is, and how much it is incumbent upon all of us to live life fully expressed, as much as is possible. So I’ll continue saying YES! to things that either advance my purpose or continue my journey of self expression, especially if it’s something that can positively impact other people. I’ll do this even if it means I get less sleep than I should. Because the truth is, all the great things that have come my way and the amazing people who’ve entered my world have happened because I was willing to say yes (or yes/and, as they say in improv), and then do it, and just let life surprise me with wonderful results, which, like “luck,” are simply the residue of what happens when opportunity meets preparation combined with intent and action. Stay tuned for my article about the power of Yes!